The Chevrolet Parkwood was the wagon model based on the full size Bel Air platform and was in its 4th generation by 1960. The big six passenger wagon isn't very collectable today even in mint condition, probably because it is slow in stock form...but today's Parkwood is anything but stock. Find this 1960 Chevrolet Parkwood Wagon for sale in Springfield, MO currently bidding on ebay for $8,788 with a few hours to go. This Parkwood has been prepared in the "rat rod" school of paint/body - basically that means that the previous owner has decided not to paint it. Sure, some patina is cool, but too many rat rods are just buckets of rust/crap and embarassing to drive. But this one has big holes in the hood that help to forgive some of the red steelies, whitewalls and rust look. Pop the hood and expose a GM LS-series V8 (probably an LQ9 or some other iron block V8, but who knows) that is blown by a huge single intercooled turbo setup. The seller makes the comment "THE TURBO FUEL INJECTED LS MOTOR RUNS STRONG, BUT BECAUSE OF THE WEIGHT OF THE OLD CAR, ITS NO HOT ROD." A turbocharged LS-series V8 should easily push out 400-500 horsepower and this thing should weigh around 4100 lbs, so it should move well. The inside is as ratty as the outside and unfortunately the Parkwood was not available as a 9 passenger wagon, so this one can only haul 6 adults in comfort. 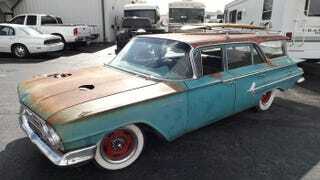 Originally posted as 5k: LS Turbo Rat Rod: 1960 Chevrolet Parkwood Wagon on Daily Turismo.